East Village residents will notice new trucks in our alleys for the next six months. Our blue recycling carts will be collected by Waste Management instead of the Department of Streets & Sanitation. 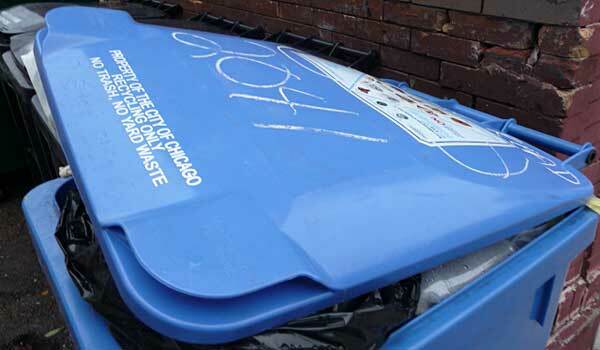 Streets & San will still be collecting blue carts in some areas of the city, and a third private company, Metal Management Midwest, will be handling other areas. Mayor Emanuel authorized this trial to see if city employees can effectively compete with private companies. A cost-benefit analysis will be conducted at the end of the trail to evaluate performance and costs. If the private contractors can handle recycling as effectively as the city workers at a lower cost, recycling services may be privatized to help cut into the city's massive budget deficit. One change that residents may notice is that the private companies are authorized to leave orange warning stickers on recycling carts that contain materials that the recycling program does not accept. This type of feedback has been missing in Streets & San collections, at least from my inspections of blue carts. The private contractors will also be single-worker trucks, with the driver also emptying carts. More details about this trial can be found in a Chicago Tribune article. While the promise of efficiency and economy is attractive, the real story will no doubt be nuanced. Waste Management helped design the blue bag recycling program that the city abandoned in 2008. The Chicago Recycling Coalition provides additional analysis of factors that bear watching as this trial takes place, as well as a place to collect feedback about this experiment in managed competition.